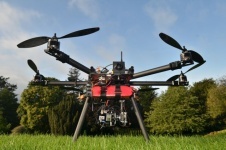 University of Bristol researchers have unveiled a large semi-autonomous drone called the ARM system which could be used to provide visual, thermal and radiation monitoring of radiation after a release of nuclear material. An example of the potential applications are the nuclear incident at the Fukushima Daiichi power plant in March 2011, which was hit by a magnitude 9 earthquake and tsunami, to help detect radiation and prevent exposure to response crews. The ensuing hydrogen explosion from the incident, resulting from runaway corrosion of the fuel cladding, caused a significant atmospheric release of radioactive material. Most of this material was removed from the atmosphere by rainfall but contaminated a large area of land extending up to 200 km from the site. The inundation also disabled 23 of the 24 radiation monitoring stations surrounding the site, leaving disaster response teams effectively ‘blind’ to the ensuing radiation hazard. Built by Dr Oliver Payton and Dr James Macfarlane, both members of Bristol’s Interface Analysis Centre (IAC) in the School of Physics, the ARM project is based around using unmanned aerial vehicles (UAV) with on-board microcomputers and sensors to provide an improved alternative to manned flights if such a disaster should ever occur again. The University of Bristol is now working closely with the National Nuclear Laboratory to offer this technology in Japan as a tool for assisting with environmental surveying during the ongoing Fukushima clean-up operations and in the surround prefecture. The team are also working to develop UAV mapping and exploration algorithms for projects relating to the detection of buried explosives and depleted uranium ordinance.